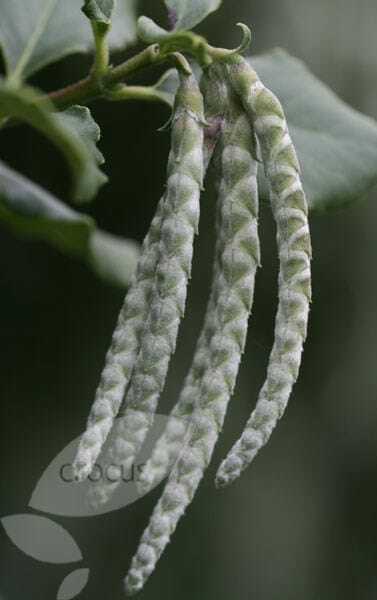 Long, silvery catkins up to 20cm long, shine out among glossy, wavy-edged, dark green leaves throughout winter. The silken tassels of this upright, evergreen shrub make a stunning feature in the winter garden. Try it towards the back of a sunny, shrub border, against a wall or as a windbreak in coastal areas. When it has finished its display, the dark foliage makes a lovely foil for summer-flowering shrubs. So impressed with the condition this plant in. It was excellent, now very happy in our back garden. Recommended by a professional gardener to hide an awkward corner where 3 garden fences meet. It's evergrren, pretty leaves & catkins for interest. Well packaged on arrival. Been hunting for one of these silk tassel trees for about a year. Over the moon when Crocus had one in stock. Plant arrived, was smaller than I hoped but very healthy with one silk tassel and glossy leaves. Potted it on and with in the season it had doubled in size and was covered in tassel buds. Once the new bed area was ready it went into the ground and has probably doubled in size again. it's currently covered in stunning silk tassels. I am excited to see them open up and expect it to be a stunning backdrop to a perennial bed. Delighted with the quality of the plant. I bought one 2 years ago which died over winter despite following the instructions. This one has overwintered very well putting on much new growth. I'm excitedly awaiting the first catkins! My gary is absolutely beautiful. It has given us lovely long tassels ever since it was planted. I'm worried this year as some of the lower/half leaves are going specaldy yellow. There have been some before but very limited. It is now just under 2 mtrs in height. Never been pruned. Is it lacting nutrients. Hello, It is quite normal for evergreen shrubs to lose some of their lower (older) leaves as they put on new growth each year, but if it is quite a significant loss, then I suspect that it does need a feed - a good general purpose one like Vitax Q4 would work well. Hi. I live in Southern Scotland and have an exposed windy west facing site. I have used your plant selector to sub select 'exposed to winds' and it has come up with this plant. When I look at the RHS website it says that this plant is prone to wind scorch. Please can you advise because it could be a costly mistake!!! Hello, This is a bit trickier than it sounds as while it can be used as a windbreak in milder coastal areas, it is not fully hardy so will need protection in colder areas. Therefore, I doubt it would be ideal for your exposed garden in Scotland. I have a Garrya planted approx 1 ft from my boundary and it has been there 20 years or so and is approx 3m high but my neighbor is going to build an extension on his side of the boundary and I'm worried about the roots getting damaged. Do the roots spread widely and if they do will the plant die off if they are damaged? Hello there Unfortunately it is hard to say how far the roots will have spread, as roots will naturally go towards available water and don't spread evenly. Whether the plant will die, this it really depends on how much of the root system is damaged. hi could i grow this in a large pot in a coastal south facing garden up the front wall of a garage? does it need support to climb or is it self attaching? Hello, These plants are not suited to very exposed coastal gardens, however if you are set back a little, or have a very sheltered garden, then you may get away with it. Ideally however (as they get pretty big), they should be planted out into the ground where their roots can spread out and grow. Finally, these are shrubby plants, so if you want them to grow flat against a wall, their stems will need to be tied onto support of some kind. I am trying to find a nice plant to cover a wall by my front door. One that can be neatly grown around a gas meter box. Either planted in a pot or in the ground. The ground is heavy clay and it is west facing covering a wall area of 3.5 meters by 2.5 meters approx. Any suggestions? I was thinking of putting a large trough or plant some plants into pots around it. Hello there A Garrya would be lovely grown against a wall. It will tolerate a clay soil and likes a west facing aspect, but if possible I would grow it in the ground as this is quite a large shrub. Hope this helps. 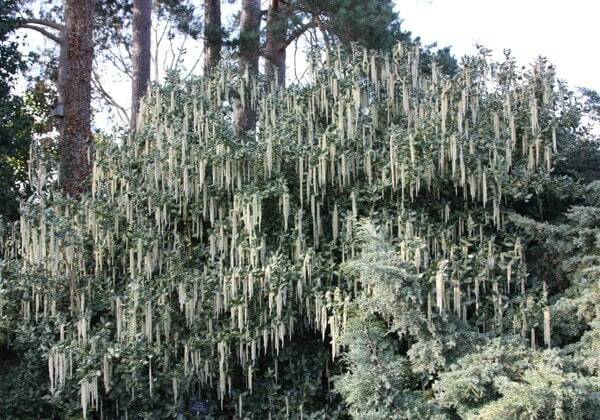 If I let Garrya Elliptica grow to 4m, against a fence, (for privacy) will it look unkempt or straggly? Does it need to be pruned, or is it ok without it? Also, when the tassels fade, do they turn brown and remain on the bush for a long time, or do they drop off after they have faded? Also, do the catkins drop off whole, or do they crumble? I am wondering how much of a mess it makes when they fall off. Thank you. Hello, These make very handsome wall shrubs, particularly if they are given a little formative pruning. For best results cut way any outward facing stems when you plant it, leaving just one or two stems that will create a permanent framework. These remaining stems can then be tied onto a support - ie. trellis panel or wires. Then as the plant grows, you can pinch out the growing tips of any outward-facing shoots as this will encourage side branching, or remove badly placed branches to their base in early spring. Lanky lateral growth can be trimmed back, again to encourage bushy new growth, which can be tied onto the support as it grows. As for the catkins, they do turn brown as they mature and do remain on the plant until they become almost crispy. At that point they can either crumble entirely, or fall off in one piece. I have a garrya elliptica which has never produced tassels in the five years I have had it growing on a north facing wall. I have never pruned it and it is growing quite well but is straggly. Will it ever produce tassels? Hello there Given the right conditions it should produce tassels, you could always try and give it a push by feeding through the growing season with a high potash feed. You can give it a light trim to remove any dead and straggly branches in April or May. Hope this helps. 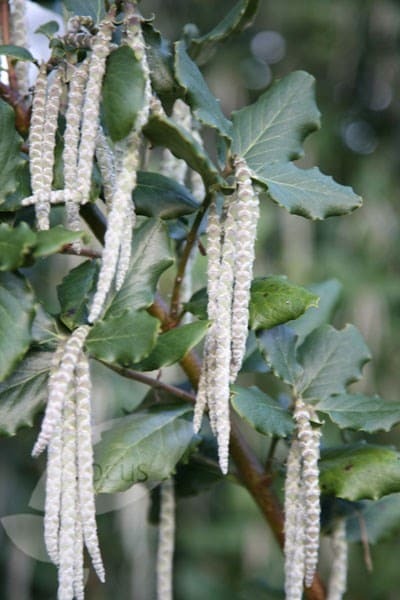 Can I grow garrya elliptica in a pot?